The Saloon posse designer now has full Campaign support! 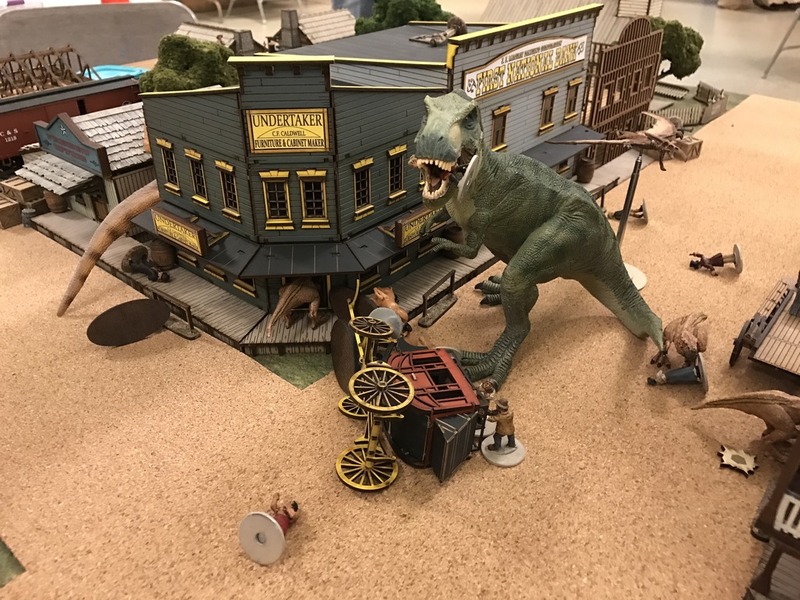 This post will cover Saloon updates as well as Windy River Campaign updates, specifically what happened during the End of Encounter process from the Big Raid at Little Hyran Mine. First of all I’m very pleased to announce I’ve added extensive Campaign specific support to The Saloon online posse designer. The program has been great so far, specifically the PDF export feature I use heavily in all my games. But it was also somewhat lacking for ONGOING posses, instead of just initial creation. Well this latest update remedies this problem and means I can track everything from used medical devices to Wounds and Injuries. The entry to this magical land of campaign tracking goodness is the new “Campaign” mode checkbox, pictured to the right. This checkbox value will be persisted when you use the “Save to URL” function. There is also a warning beside the checkbox telling you the Campaign mode is for advanced users. So advanced in fact that if this is your first visit to The Saloon this checkbox won’t even be displayed! “Use” Medical Devices by clicking the little pill icon ( ) to the left of the Medical Device in the Inventory section of each posse member. Sell any viable piece of equipment (price must be greater than or equal to $10, as per the rules) by clicking the “dollar sign” ( ) to the left of the item. You can also sell your Dinosaur (again as per the rules) instead of flat out removing them. Tooltips have been updated to reflect what each button icon does. Manage Wounds/Injuries! Select the entity you want to manage and click the “Wounds/Injuries” button to open a new panel below the posse list. From here you can choose a Wound/Injury from the full list and apply it to that entity, or Heal it when the time comes. All Wounds/Injuries are properly persisted when you use “Save to URL”. Wounds/Injuries are noted by bolding the HP field in the posse list, which can then be moused over to see the full list of what is affecting the entity. 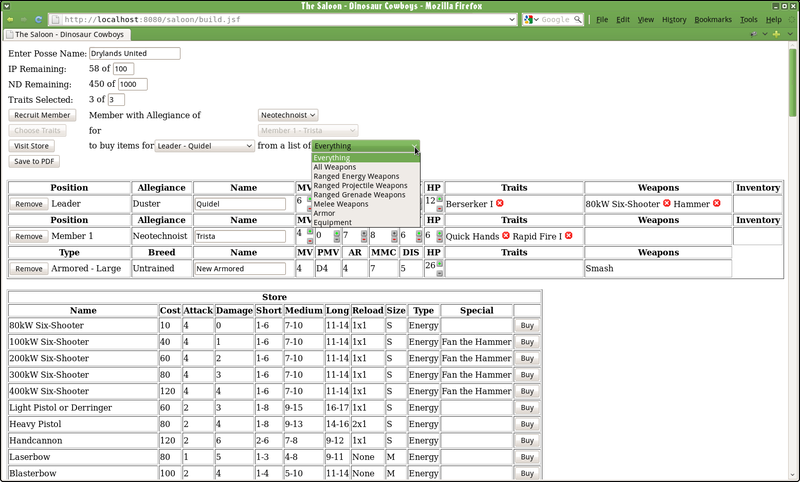 If the “Apply to PDF?” checkbox is selected any Wounds/Injuries will be noted at the top of the “Current HP” field in the PDF, and directly modify stats if possible (so a “Busted Leg” with -1 Speed would indeed reduce the character’s Speed on the PDF roster). I finally got around to sitting down and figuring out Wounds/Injuries and what to do with my leftover IP and ND from last game. 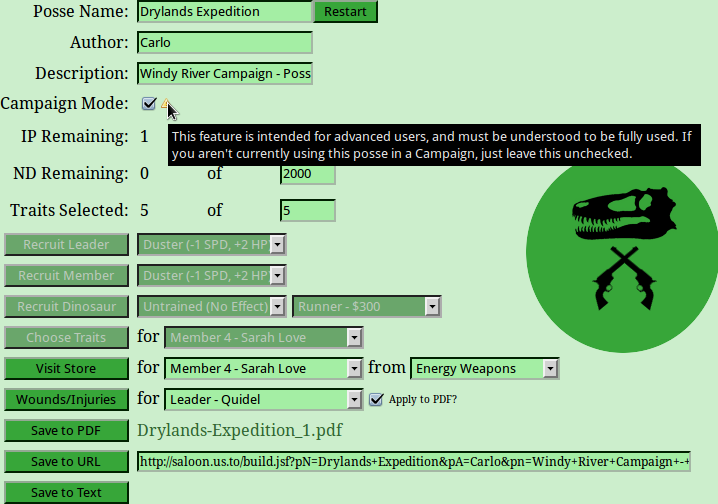 The Drylands Expedition is at 179 IP, $2,000, and 5 Traits, and I need to spend some of that! After much deliberation I decided it’s time to recruit a new Member! So exciting. Also a little sad because my roster is now full :( I don’t have a ton of IP to really bring them up to snuff with the rest of the posse, so they will start a bit wet behind the ears, but that’s okay because it’s realistic and fun to try to keep them alive. So let’s all take a moment and welcome “Sarah Love”, a Duster cowgirl with a brace of pistols and a sunny disposition. She is a wandering caravan guard that happened to stumble across Hyran Mine soon after the attack. Having heard of the Night Daggers, seen the effect of their Toxic Guns (poor Amp! ), and generally finished her current caravan job, she joined the Drylands Expedition in their quest for revenge (and an antidote). As I said she’s a Duster, and the model I have for her is pictured to the right. Currently she’s unpainted, but I have her based and undercoated, so hopefully I can remedy that problem this weekend. I won’t get a chance to play Dinosaur Cowboys before then anyway, so the next time you see her she could be all done. The model is great with a very dynamic “over the shoulder” pose. 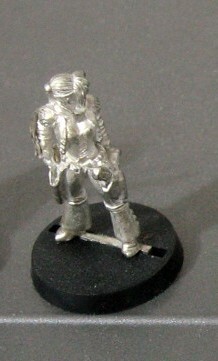 She has a ton of cool looking pistols belted onto her hip, 4 in total. So I figured I’d run with that idea in regards to her equipment. I gave her TWO Handcannons ($240 total). That means she’s actually better equipped than Quidel, so guess who will get an upgrade in the future? Anyway after Campaign recruitment of $250 that left me with exactly 0 ND, so no armor to start. For statistics I didn’t have a ton of IP, like I said, but I did manage +1 Defense and +1 Speed (she’s also faster than Quidel!). Unfortunately no Ranged Target Number improvements so her shooting might be lackluster to start. But with the “Dual Wield” variant rule she’ll get 3A-6D on those awesome Handcannons. Know what would make them even more potent? The Rapid Fire Trait which gives +2 Range Attacks once per encounter. 5A-6D…swoon! I actually had enough IP left to boost Amparo’s Hitpoints from 9 to 10, which will also help reduce his chance to take a Bravery Test. And that means my entire Posse has double digit Hitpoints (finally)! I also did the unfun process of seeing how my numerous Out of Action characters did. As you might remember everyone but Dwaal was Taken Out of Action last game, haha. However I HUGELY lucked out on rolls with only Quidel suffering an Injury! The rest passed their 8+ Wound Test roll. Quidel rolled a 2-4, which gave him a temporary “Broken Knee” which means he cannot Hustle! At 3 Speed…ouch. Sort of ironic (and vaguely karmic) though since his Trait is “Knee Shot”. I can’t complain too much though considering everyone but the dinosaur was taken out. Like I said I probably won’t get a game until this weekend, but I do have the Night Daggers Antidote Defense posse (PDF) all setup and ready to go! I haven’t talked about much computer stuff on this blog, but today I found two useful commands on Linux for combining separate PDFs into a single file. The reason I wanted this is I’m going to try to get some additional outside playtesters and I figured the easier I can make the setup process the better. So I wanted to make half a dozen “starter” Posses and combine them into a single “playtesters package” file. A very handy utility for PDFs, and a very simple command. This worked perfectly for merging a bunch of exported posse rosters from The Saloon into a single file. The above command would combine “filename1.pdf” and “filename2.pdf” into combined.pdf. I exported every single saved posse currently on The Saloon, which ended up being 19 posses. Then using PDFTK I combined them into a single file that you can check out here. This would be perfect for making a printed folder of available posse choices, and is much easier compared to having a bunch of separate files. Check out 19 sample posses (PDF) combined from separate files. Some more great news from the busy world of The Saloon posse designer. I now have PDF export working 100%, complete with properly transparent HP values, Allegiance/Breed being “circled” to represent selected, and even nice touches like putting the version number in the bottom right corner. Check out an example PDF exported from the app. Pretty slick eh? Looks a little messy eh? Normally you’d link it like “Hey guys check out my new posse!” and that looks mighty fine. To access this feature for your own Posse just click “Save to URL” and copy the link that is generated and then paste it to your hearts content on forums, blogs, email, etc. Another neat feature is the Load Recent Posses link that displays the 5 most recently saved Posses from ANYONE. That means you could go into the app right now and create a Posse and a user on the other side of the world could easily load that Posse. I like this feature as it helps make the app feel a bit more “alive” and is more of a community friendly element. Like I said it’s just the most recent 5, but if I get enough interest I might bump the number up to 20 or something. Currently the list is cleared upon shutdown of the server, but I might look into persisting it into a text file or light database. So yeah, pretty much all done now! All I need to do is provide the source code somewhere (probably as a WAR file that can be deployed but that also has the Java files in it). I like to this for webapps because who knows what will happen to me in the future, and it’d be great if the only copy of the source code wasn’t just sitting on my hard drive. I figure I’ll start advertising the app and getting some feedback and more testing from actual users sometime next week. I’m super happy with how it all turned out and how quickly it came together, and I think it makes building a posse infinitely easier and funner to experiment and test different approaches. I’ve kind of stalled out on Nanowrimo after a disastrous week 3, for which I fully blame my business trip. I haven’t hit my stride since coming back, but maybe I will before the month is out. 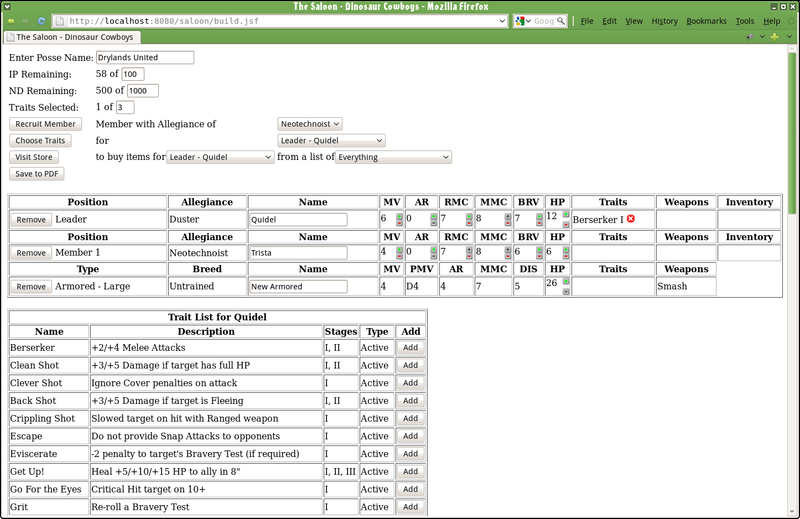 Add titles to the various elements on the page, like Weapons and Armor, etc. So basically the main areas left are three touchups to PDF export. Otherwise the PDFs come out looking AWESOME! I have the leader, all members, and the dinosaur exporting properly. 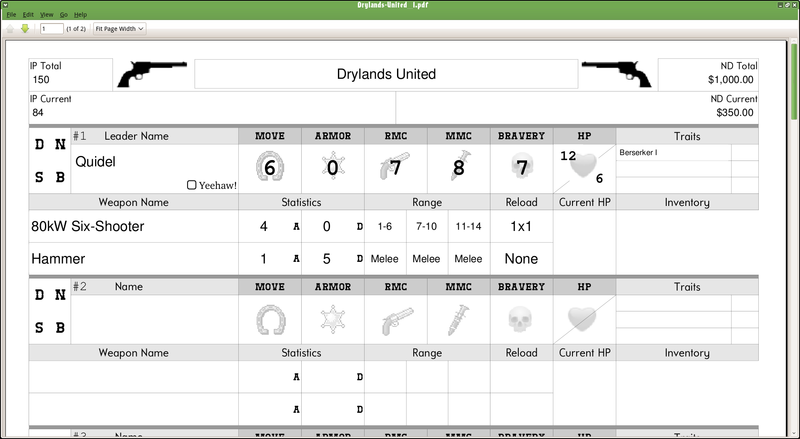 To give you an idea of how these PDFs look feel free to download Hope’s Warden posse as PDF. You might remember them from an earlier post. But yeah it’s pretty neat being able to translate a paper copy into a PDF with very little effort (it took about 5 minutes to enter the data through The Saloon). Lots of improvements and bug fixes are now in the app, so it’s worth checking out again. I’m going to wrap up PDF export soon-ish, and then put up some info on various forums so I can get some feedback and views on the application. - Added random name generation for Leaders and Members. 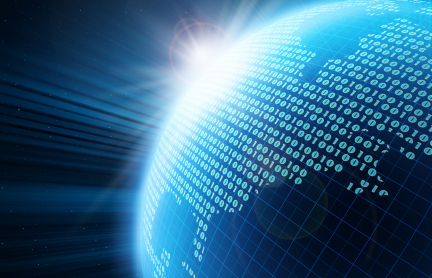 The name data is pulled from the US Census data. - Added a method for restarting the session. Some minor work around the PDF so that we don't allow a save until the posse is valid, and warn the user of what's missing otherwise. 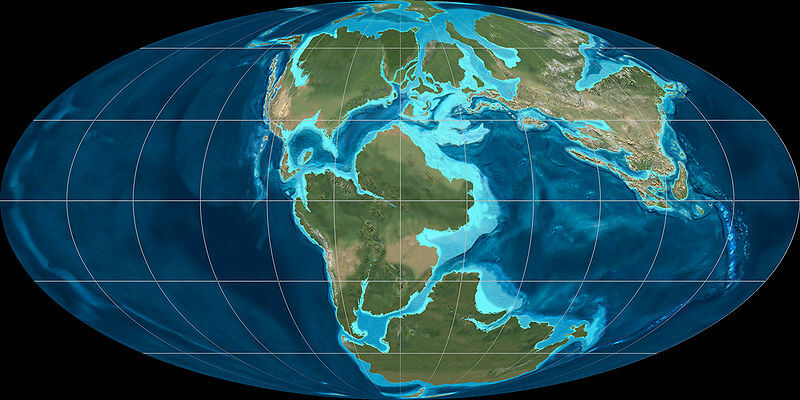 - Some minor tweaks to the layout of the ODT file. It might need to be ported back to the rulesets/cowboys/ folder after each change? - A bunch of work around the Save to PDF functionality. Now Leader and all Members export properly. Still need dinosaur and Allegiance and a few other tweaks. 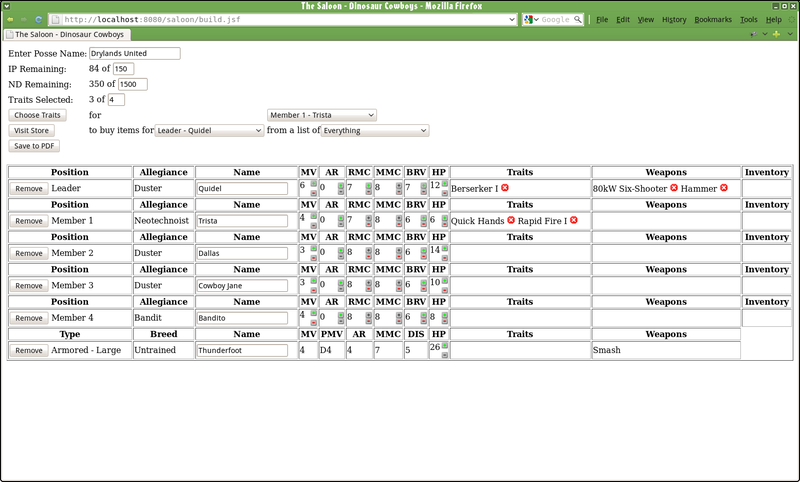 - Fixed some bugs, mainly around the opening/closing/toggling of Traits and the Store. There were a lot of ugly flags being flipped around in there. - Added introductory text to explain DC. This will only display on their first visit, after that a cookie is created and if that cookie is present the intro text won't be displayed. Also made a rad status bar overlay along the top (colors undecided) for displaying error messages and info and general stats of the posse. This helps when scrolling down into the store lists. 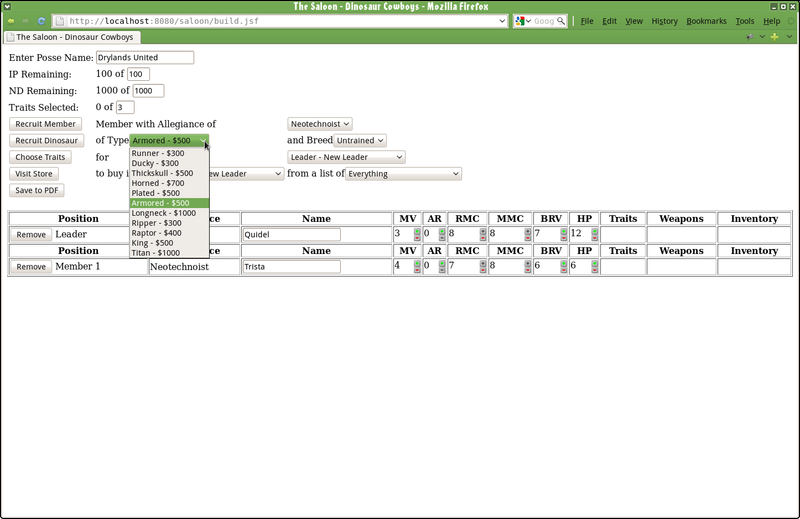 - Added sorting to every table, plus some cool cascading sorts so that clicking Name will apply to all subtables, for example. Styled the sort headers as well. If I had to sum up the big changes I’d say: tables are now sortable, new intro text for the app, terrific looking status bar that floats as you scroll, lots of optimizations with JSF’s f:ajax to reduce bandwidth per click, new random name generation for leaders and members, and obviously PDF export for everyone. As before feel free to check out the app at http://saloon.thruhere.net/. I’m going to get the PDF export going (hopefully by the end of next week, but who knows!) and then I’ll put the word out on various forums and hopefully drum up some interest and testing. Remember how I started on that fillable PDF posse roster a while back? I did some initial coding a while back, but now (between bouts of Nanowrimo) I sat down and worked on it some more. Right now it’s in a rudimentary unstyled state with a couple of missing pieces of functionality, but in general it works pretty well at creating a posse, modifying their stats, applying traits, and buying items. I’ll need to update the PDF to use v1.0 (especially the new dinosaur statline) and finish with the exporting of that, but yeah, getting close. Eventually I’ll host the application and link to it from here. It’s written with Java and JSF. No timeline on when that will be since I’m kind of just working on this when I have an hour or two. Anyways some screenshots to give you an idea of how it functions. Like I said this will be styled with CSS eventually, for now I cared more about getting the underlying logic going.